Bunaíodh an Cumann Gaelach i dTamhlacht go luath sna seachtóidí. Bhí idir dhaoine aonaracha agus grúpaí beaga, a raibh an-spéis go deo acu sa Ghaeilge ag feidhmniú go neamhspleach ar a chéile sa cheanntar. Nuair a rinneadar teangmháil lena chéile, cuireadh tús leis an gCumann Gaelach. An Ghaeilge mar chuid de shaol an phobail a bhí uathu. Níorbh fhada gur tháinig plean gníomhaíochta le chéile. Mar chraobh de Chonradh na Gaeilge, fuair baill an Chumainn an-tacaíocht sna feachtais maidir le hOideachas lán ghaeilge a sholáthair go háitiúil. Nuair a d'oscail geataí na scoile den chéad uair,bhí Páraic Mac Donnacha mar Phríomh Oide agus Deirdre Ní Dhónaill mar mhúinteoir. 32 daltaí a bhí sa scoil. Sa Phríoracht a bhí an scoil lonnaithe ar dtús. Isteach leo ansin i seomraí réamhdhéanta,áit ina bhfuil an Cumann Gaelach Thamhlachta fós, ar Bhóthar an tSean Bhádúin. D'fhreastail roinnt páistí ó theaghlaigh Gaelacha, a bhfórmhór ó theaghlaigh Béarla ar an scoil. Rinne an Cumann Gaelach sár obair maidir le suim sa ghaeilge a spreagadh imeasc na dtuistí sna blianta tosaigh. D'eagraíodar ranganna gaeilge bun, mean agus ard chaighdeán, ciorcal comhrá gach seachtain i dteach tabairne Aherne's, ranganna seite agus ranganna ceoil mar shampla. Imeachtaí eile a bhí ar siúl acu ná siuloíd bhliaintúil do theallaigh, turas gach bliain go Rath Cairn, turas Rothaíochta, dinnéar na Nollag, Céilithe rialta agus sheacht n-oiread eile. Ní gach ionadh gur leath an suim sa ghaeilge. Idir 1983 agus 1994 bunaíodh an scéim gaeltachta do pháistí sna hardranganna. Chuaigh na páistí síos chun na gaeltachta ar feadh trí seachtaine gach bliain - go dtí Baile an Fheirtéirigh i gCiarraí agus go dtí an Cheathrú Rua i gConamara. I 1985, mar gheall ar shuim na dtuistí sa ghaeilge sa cheantar, chin an Bord Bainistíocht dhá shraith a fhorbairt i Scoil Santain. Freisin i 1985, de bharr fheachtas an Chumann Gaelaigh, bunaíodh Scoil Caitlín Maude i gCnoc Mór, Tamhlacht. Sa Bhliain 1989, bhí 432 páistí sa scoil, ach ní raibh aon trácht ar mhúinteoir tacaíochta foghlama. Thosaigh feachtas láidir le go gceadófaí múinteoir tactaíochta dár scoil, máirseáil taobh amuigh den Dáil san áireamh. Eanair 1992 ar deire, ceapadh Peig Bhreathnach mar an chéad mhúinteoir tactaíochta agus í ag múineadh idir Scoil Santain agus Scoil Easpag Uí Ríain, Cluain Dolcáin. I 1987, bhog Scoil Santain go dti an suíomh ina bhfuileamar inniu. Sa scoil bhliain 2001-2002, ghlac Scoil Santain leis an gcuireadh bheith páirteach sa scéim Cothrom Dheiseanna do pháistí. (Giving Children an Even Break). Anois bhí coibhneas múinteoir páiste sna bunranganna 20:1 agus sna hArd ranganna 27:1. Fuair an scoil triúir múinteoirí breise de bharr na scéime seo. I 2002, fuair an scoil, múinteoir achmhaine nua. I 2003, thosaigh Scoil Cheoil Des Carthy sa scoil, ag soláthair ranganna ceoil do dhaltaí tar éis na scoile. 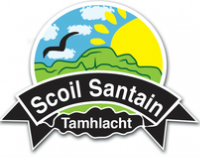 Shroich Scoil Santain breithlá ollmhór sa scoil bhliain 2004 - 2005 - 25 bliain! Cuirtear leabhar speisíalta ar fáil an bliain sin, a rinne tagairt don stair agus saol laethiúil na scoile. Rinne na tuismitheoirí cinne an bliain sin, le cead an bord bainistíochta, na hÉide scoile a dhéanamh éigeantach sa scoil. Chomh maith le sin, ghlacamar le scéim bricfeasta sa scoil don chéad uair. I 2005, ghlacamar leis an scéim "Cothroma Deiseanna" a scheachadadh(DEIS 2). Da bharr sin, tuille ceapacháin nua, múinteoir buan eile agus muinteoir tacaíochta leath aimsire lonnaithe i Scoil Naomh Dominic. Anois bhí foireann breá tacaíocht foghlamtha achmhaine sa scoil, 3 mhúinteoir buan agus .7 de múinteoireacht leath aimsire. I Mí Éanair 2006, thosiagh athchoiriú agus tógáil na scoile, sa deire thiar thall, tar éis feachtas ocht mbliana fada an Bhord Bhainistíochta, faoi chúram Hainréad Uí Fhiaich, Cathaoirleach leis an Aonad Tógála, Roinn Oideachas agus Eolaíocht. Deánadh láthair tógála de leath den scoil, agus scoilíocht ar siúl sa leath eile, maraon le sraith sealáin agus áthas an domhan ar gach éinne go mbeidh an t-aathchoiriú agus tógáil críochnaithe cóirithe lár bliana 2007.